Infrared satellite image of Tropical Cyclone Mekunu on May 23, 2018. Credit: U-Wisconsin/CIMSS. 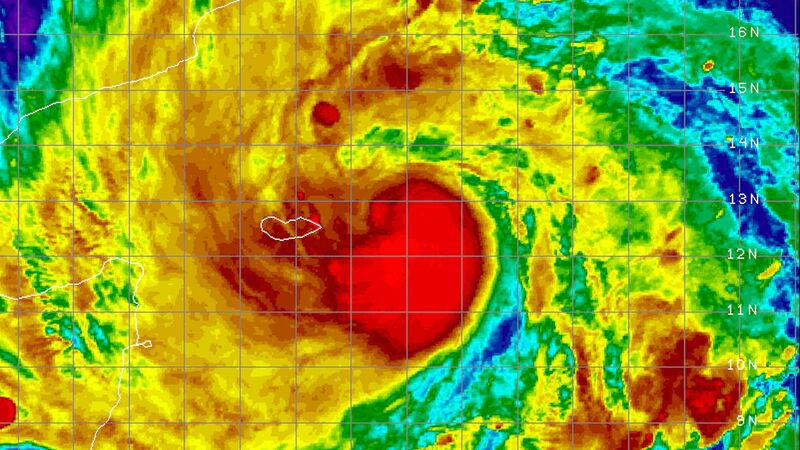 Tropical Cyclone Mekunu is gathering strength in the Arabian Sea, where it could become the equivalent of a Category 2 or even Category 3 storm prior to making landfall in an unusual place: Southwestern Oman. Why it matters: The storm is projected to move to the north-northwest through Saturday, eventually making landfall near the port city of Salalah. The city has a population of about 360,000, and typically receives just 5 to 8 inches of rain in an entire year. This storm could bring that same amount in under a day, presenting the risk of life-threatening flash flooding, in addition to damage from high winds. Threat level: The flood threat will extend to northeastern Yemen and the desert of Saudi Arabia, where the storm will fizzle over the weekend, due to the ingestion of hot, dry air sitting over the Kingdom. Unprecedented: According to the National Oceanic and Atmospheric Administration's database, no Category 2 or stronger storm has made landfall in southwestern Oman, making this a unique threat. Cyclone Mekunu also comes just one week after Cyclone Sagar struck Somalia and Djibouti, causing flooding in several countries.